It wouldn’t be a typical day in Vancouver real estate without another debate over supply. The latest numbers out from UDI (Urban Development Institute) highlights new construction is far outpacing population growth. Metro Vancouver’s net population change was down 11% from the same quarter last year and down 26% from the five year average. Further, The current ratio of 1.3 new residents per housing start is well below the five year average of 2.1 new residents per housing start. This should come as little surprise to those who have been reading this blog. There’s plenty of evidence to suggest we have been overbuilding the last few years. Including an Avalanche of New Supply Under Construction, the most on record. Despite the record building, prices continue to soar as our promised new supply hits the open market in Hong Kong. Offshore investors desperate to park cash into global real estate are snatching up Vancouver pre sale condos at a torrid pace. The tax exempt pre sales are even being snatched up in Surrey. The latest Includes Concord Pacific’s Park Boulevard development. 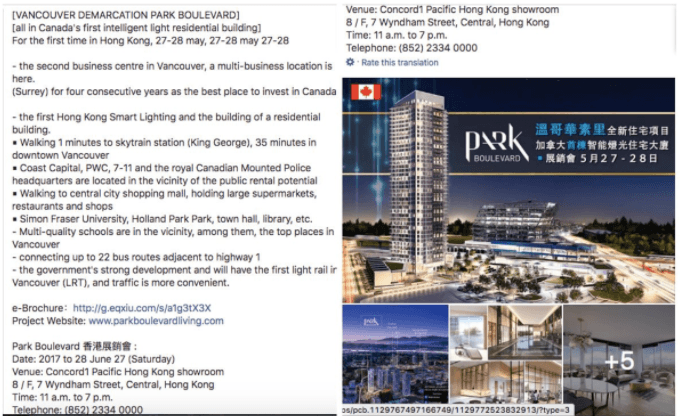 Surrey’s Park Boulevard being sold in Hong Kong sales centres. A crippling blow to the city of Surrey, griped with house lust, where prices have now shot up 27% year over year and inventory has plunged a remarkable 60%.